Maclean, C.J. *, Metzger, B.P.H. *, Yang J.-R.*, Ho, W.-C., Moyers, B., and Zhang, J. (2017) Deciphering the genic basis of environmental adaptations by simultaneous forward and reverse genetics in Saccharomyces cerevisiae. Molecular Biology and Evolution. In press. Metzger, B.P.H., Wittkopp, P.J., and Coolon, J.D. (2017) Evolutionary dynamics of regulatory changes underlying gene expression divergence among Saccharomyces species. Genome Biology and Evolution. 9(4):843–854. Metzger, B.P.H. *, Duveau, F.*, Yuan, D.C.*, Tryban, S., Yang, B., and Wittkopp, P.J. (2016) Contrasting frequencies and effects of cis- and trans-regulatory mutations affecting gene expression. Molecular Biology and Evolution. 33(5):1131-1146. Metzger, B.P.H. *, Yuan, D.C.*, Gruber, J.D., Duveau, F., and Wittkopp, P.J. 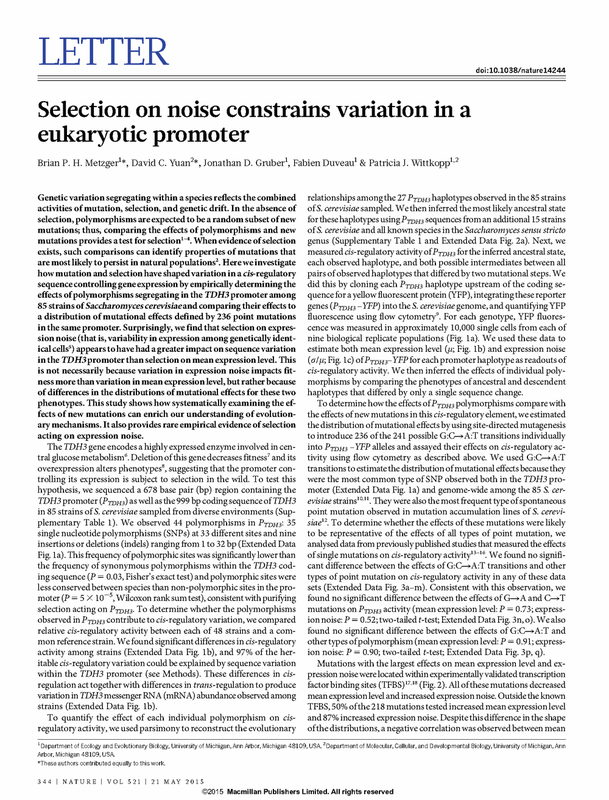 (2015) Selection on noise constrains a eukaryotic promoter. Nature. 521:344-347. Duveau, F., Metzger, B.P.H., Gruber, J.D., Mack, K., Sood, N.^, Brooks, T., and Wittkopp, P.J. (2014) Mapping small effect mutations in Saccharomyces cerevisiae: impacts of experimental design and mutational properties. G3: 1205-1216. Metzger, B.P.H., Gelembiuk, G.W. & Lee, C.E. 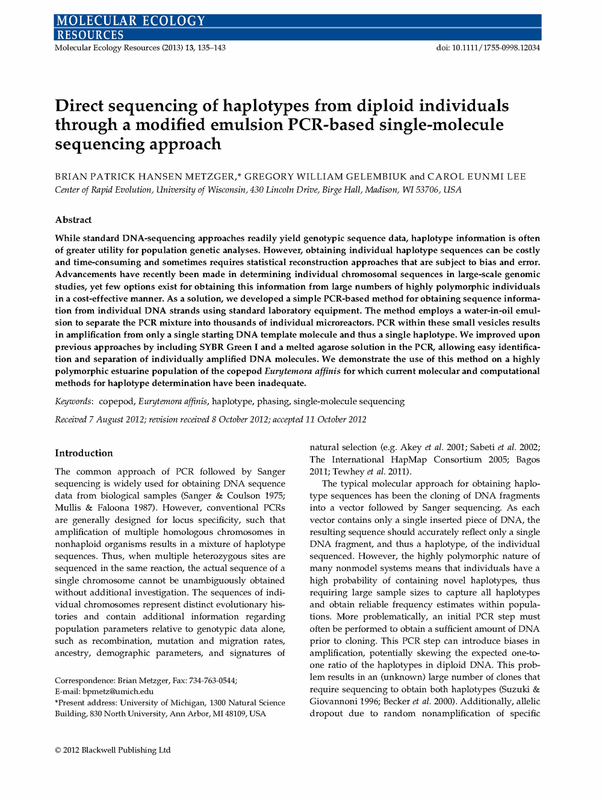 (2013) Direct sequencing of haplotypes from diploid individuals through a modified emulsion PCR-based single-molecule sequencing approach. Molecular Ecology Resources, 13, 135–143.